Cholula, just outside the city of Puebla, is the site of the massive Cholula pyramid (The Great Pyramid of Cholula). In the days before the Spanish conquest, Cholula was a sacred city, and also a major commercial centre. When Hernan Cortes say it, he declared it to be the most beautiful city outside of Spain itself. The area has probably been inhabited for over 3000 years, and the original pyramid may be over 2000 years old. Over 2000 years ago, Cholula was rising from being a village to being a city of some importance. As the city became a place of power, many of the powerful cultures of Mexico had their turn to rule it - the Olmecs, Toltecs, and later the Aztecs, with whom the city had some alliance. The city was once called Acholollan (in Nahuatl), meaning place of flight or water that falls in the place of flight. This has led some to believe that Cholula was founded after it's inhabitants fled from elsewhere. 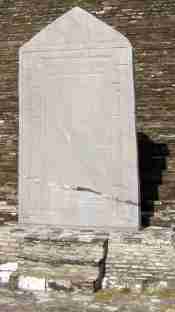 An altar at Cholula. Underneath were found seashells, an offering to Quetzalcóatl. The earliest pyramid was probably built around 200 BC. As the years passed and the city grew in power, it was often able to maintain a degree of independence from the empires that surrounded it. Just how much independence is a matter of some debate. From the architecture and items found at the site, we know that Cholula had strong relations with no only nearby cities such as Tenochtitlán, but the coast as well. For example, archaeologists have found seashells beneath one of the altars, an offering to Quetzalcóatl. Each group that dominated Cholula added to the pyramid (technically called a temple, not a pyramid), until it became the massive structure larger than any of the pyramids of Egypt in volume. The people of Cholula participated in much religious ritual, including human sacrifice, including the sacrifice of children. But after a time, the Cholula pyramid was left to be overgrown by wild plants, and it disappeared under a mound. An excavated and restored side of the great Cholula Pyramid. Other alters were eventually built, and a temple was built on top of the mound. Ancient chronicles give us a glimpse into the beliefs of this era. Apparently there was a drought in the area, and the people came to the priests for help. The priests needed to send messengers to the god of rain, Tlaloc. These messengers were children, who were decapitated in order to send them on to the next world. In front of what is now called the Altar con Ofrenda was found one such offering - two children with severely deformed skulls, who had been beheaded. The Altar con Ofrenda where the bodies of children were found. Cholula maintained an uneasy alliance of sorts with Tenochtitlán. The two cities arranged ritual flower wars. 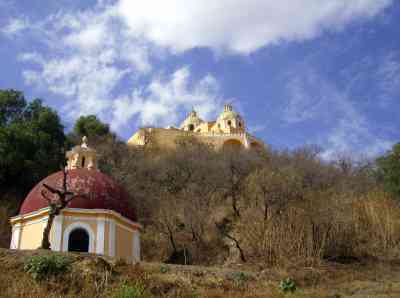 Being an important sacred centre, even the Aztec leaders went to Cholula to be annointed. Pilgrimages were made to the city for times of worship. 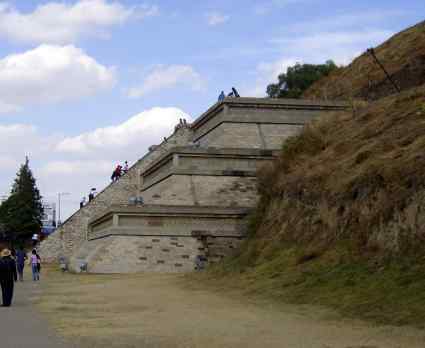 The Aztecs believed that Xelhua, one of the giants from their mythology, had constructed the pyramid of Cholula. Upon the arrival of Cortés, Cholula was Mexico's second-largest city, with a population of up to 100,000 by some estimates. There is some disagreement about what happened next, but it appears that Cortés discovered the alliance between Cholula and Tenochtitlán, perhaps he became aware of a plot against the Spaniards, and he decided to make a pre-emptive attack. As a result, thousands were slaughtered by the Spaniards - Cortes claimed 3000 were slain in three hours, but conquistador Bernardino Vázquez de Tapia claimed that the death toll was 30,000. Whatever really happened, the massacre had the effect Cortés wanted, and the people of Mexico were much more inclined to surrender. The temple was destroyed, and a church was built on the pyramid of Cholula, which the Spaniards seemed to believe was only a large hill (remember, by now it was overgrown). 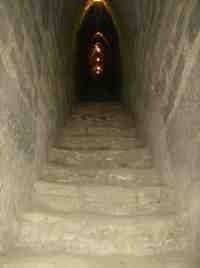 The tunnels under the Cholula pyramid, regularly explored by tourists. From the 1930s until today, massive efforts have been made to excavate the pyramid. 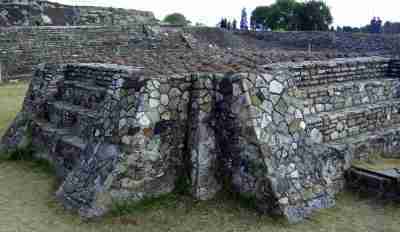 Tunnels were dug inside the structure (about 8km/5mi of them), and many discoveries were made about the various structures built on top of one another. There are replicas of some of the frescos that were found for visitors to see. One mural that was discovered is a life sized scene of drinking and inhebriation. It may depict the effects of a drugged potion from the period. Visitors can also explore the tunnels, alone or with a guide. The base of the Cholula pyramid measures 450 x 450m (492 yards) and is 66m (72 yards) high. Its total volume is estimated at 4.45 million m³. You can read more about what the Cholula pyramid is like today here. It's a fascinating site to visit, and really doesn't get the recognition it deserves as an important historic site and interesting tourist site. Urbanization of the area encroaching on the pre-hispanic site kept Cholula and its pyramid off the list of World Heritage Sites. Still, there is no site like it in the world.